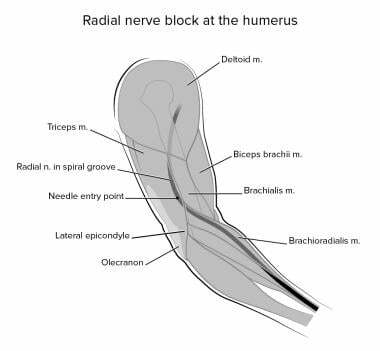 Radial nerve block is a simple procedure that can be performed at various levels along the course of the radial nerve. Surgical anesthesia, postoperative analgesia, and palliative measures for acute painful conditions are all indications for radial nerve block. The radial nerve is 1 of the 4 important branches of the posterior cord of the brachial plexus and has the root values of C5, C6, C7, C8, and T1. 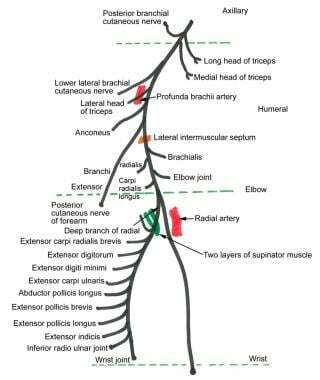 The mnemonic STAR (Subscapular, Thoracodorsal, Axillary, Radial) is an easy way to remember the 4 branches. 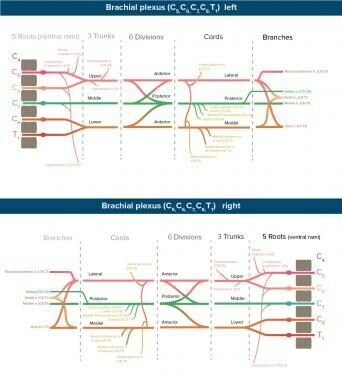 A brachial plexus schematic, radial nerve sensory distribution, and radial nerve course are shown in the images below. Sensory distribution of the radial nerve. Course of the radial nerve. In the axilla, the radial nerve descends behind the axillary and brachial arteries, passes between the long and medial heads of the triceps muscle, and enters the posterior compartment of the arm. It then winds in the spiral groove of the humerus with the profunda brachii vessels. Just above the elbow, it pierces the lateral intermuscular septum and continues downward into the cubital fossa between the brachialis and brachioradialis muscles. At the level of the elbow (lateral epicondyle), it divides into superficial and deep branches. The superficial branch of the radial nerve descends lateral to the radial artery and passes backward under the tendon of the brachioradialis muscle. It then continues distally between the brachioradialis and supinator muscles before descending onto the dorsum of the hand. It provides cutaneous innervation to the lateral two thirds of the dorsum of the hand and the lateral two and one half proximal phalanxes. The deep branch of the radial nerve winds around the lateral part of the neck of the radius and enters the posterior compartment of the forearm. It descends between the superficial and deep layers of the supinator muscle and reaches the dorsal aspect of the interosseous membrane. It innervates the extensor carpi radialis brevis, supinator, extensor digitorum, extensor digiti minimi, extensor carpi ulnaris, abductor pollicis longus, extensor pollicis longus, extensor pollicis brevis, and extensor indicis. It also provides articular branches to the wrist and carpal joints. 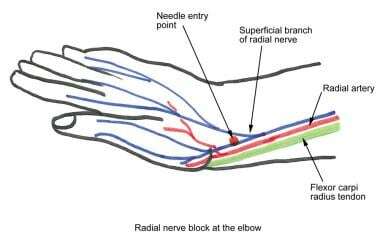 Radial tunnel syndrome:  This is a painful condition of the radial nerve. To distinguish radial tunnel syndrome from tennis elbow, palpate the lateral epicondyle. In tennis elbow, this palpation reveals tenderness over the lateral epicondyle that is absent in radial tunnel syndrome. Cheiralgia paresthetica or Wartenberg syndrome:  This syndrome is secondary to compression of the radial nerve distal to the musculospiral grove. Compression occurs because of the brachioradialis muscle during forearm pronation. The syndrome is manifested by painful paresthesias and decreased sensation over the dorsum of the hand. In adults, the radial nerve block is well tolerated with reassurance from the practitioner. Skin infiltration with lidocaine 1% 0.5-1 mL suffices to facilitate needle entry. For more information, see Local Anesthetic Agents, Infiltrative Administration. Extremely anxious patients may benefit from oral diazepam 10 mg the night before or intravenous midazolam (1-2 mg, titrated to sedation) prior to the block. General anesthesia may be needed for pediatric patients. Position the patient comfortably with the affected arm well supported. Usually, the supine position is preferred, with the arm supported on the side. Radial nerve block at the humerus level. Palpate deeply between the heads of the triceps muscle and the brachialis muscle to identify the musculospiral groove. Prepare the skin with an antiseptic solution. To facilitate needle entry, infiltrate the injection site with lidocaine 1% 0.5-1 mL. Insert the 25-ga 1-in needle perpendicularly toward the musculospiral groove. Identify the nerve by paresthesia or nerve stimulator technique. If no response is elicited, redirect the needle slightly more anteriorly or posteriorly until the response is elicited. Aspirate gently to identify intravascular location of the needle. If the aspiration is negative, slowly inject 7-10 mL of the local anesthetic in slow increments, with intermittent aspiration. The image below shows landmarks for a radial nerve block at the humerus level. 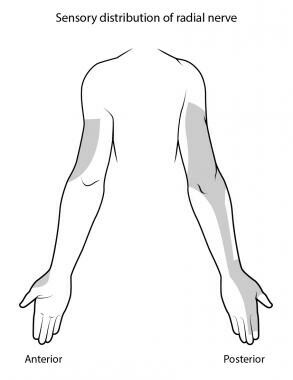 Identify the lateral margin of the biceps tendon at the elbow crease by flexing the elbow. Insert the needle just lateral to the tendon and advance it in a slightly medial and cephalad direction toward the humerus. 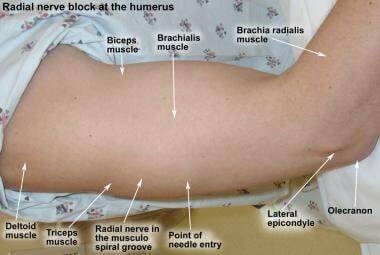 Landmarks for a radial nerve block at the elbow are shown in the image below. Radial nerve block at the elbow. The bicipital aponeurosis is visible. Needle entry is just lateral to the bicipital aponeurosis. After negative aspiration, slowly inject 7-10 mL of the local anesthetic. 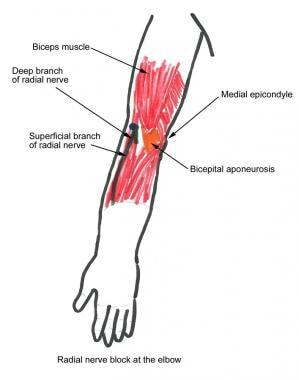 Landmarks for a radial nerve block at the elbow are shown below. Radial nerve block at the elbow. Radial nerve block at the wrist level. Inject 5 mL of local anesthetic subcutaneously, just above the radial styloid, aiming medially. 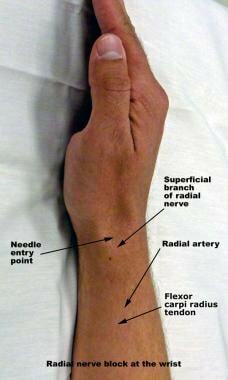 Additional landmarks for a radial nerve block at the wrist are shown below. Radial nerve block at the wrist. Extend the infiltration laterally, using an additional 5 mL of local anesthetic. The radial nerve block may be performed solely or in combination with ulnar and median nerve blocks. This block can be performed at the humerus, elbow, and wrist levels. Lidocaine, bupivacaine, ropivacaine are the local anesthetics typically used for this procedure. Surface landmarks, paresthesia, nerve stimulation, and ultrasonographic guidance are all helpful in performing the radial nerve block. Take care to avoid intraneural or intravascular injection of the local anesthetic. Complications after wrist block are typically limited to residual paresthesia due to an inadvertent intraneuronal injection. Systemic toxicity is rare because of the distal location of the blockade. Nishanian E, Gargarian M. Regional anesthesia. Hurford WE, Bailin MT. Clinical anesthesia procedures of the Massachusetts General Hospital. 5th ed. Philadelphia, Pa: Lippincott-Raven; 1998. 264. Waldman SD. Radial Nerve block at the humerus. Atlas of Interventional Pain Management. 2nd ed. WB Saunders; 2004. Chap 43, pp 166-70. Overbaugh RH. Peripheral nerve blocks of the upper extremity. Waldman SD. Pain Management. Philadelphia, Pa: Saunders Elsevier; 2007. 2nd ed: Chap 146, p 1233. Wrist Block. The New York School of Regional Anesthesia. Available at http://www.nysora.com/posts/view/94. Accessed: January 17, 2009. Wong DM, Gledhill S, Thomas R, Barrington MJ. Sonographic location of the radial nerve confirmed by nerve stimulation during axillary brachial plexus blockade. Reg Anesth Pain Med. 2009 Sep-Oct. 34(5):503-7. [Medline]. Goldstein B. Musculoskeletal upper limb pain. Loeser JD. Bonica's management of pain. 3rd ed. Philadelphia, Pa: Lippincott-Raven; 2001. 1032. Guntz E, Herman P, Delbos A, Sosnowski M. The radial nerve should be blocked before the ulnar nerve during a brachial plexus block at the humeral canal. Can J Anaesth. 2004 Apr. 51(4):354-7. [Medline]. [Full Text]. Foxall GL, Hardman JG, Bedforth NM. Three-dimensional, multiplanar, ultrasound-guided, radial nerve block. Reg Anesth Pain Med. 2007 Nov-Dec. 32(6):516-21. [Medline].